This is a special hair concentrate. We call it super. 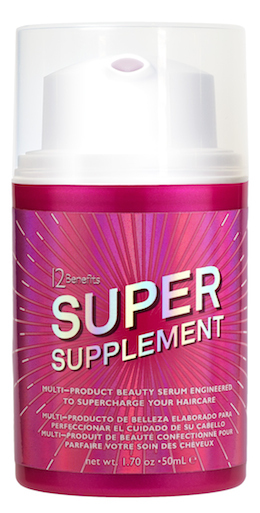 Super Supplement is food for your hair. A one-of-a-kind serum engineered to blend with any rinse-out haircare product. With only 8 ingredients, your results are longer, stronger, glossier, ultra supple hair! Our lab has developed this enhancing mix from vegetables, fruit, flowers and essential minerals that provide critical nutrients for hair repair, hair protection, hair shine, hair length, hair strength, and hair improvement on a weekly basis. Our ingredient stars soften and condition and are naturally sourced to strengthen hair day after day. Use 1. Supercharge rinse-out hair conditioners, hair masques, treatments, elixirs. Blend a quarter size amount up to 5 pumps Super Supplement with 12 Benefits Conditional Love hair moisturizer or another hair conditioner type. Comb through. Leave 2-3 minutes. Rinse. Use 2. Intense resurfacing / internal beauty aid for compromised, stressed hair. Blend quarter size amount up to 5 pumps Super Supplement by itself to freshly shampooed and towel blotted hair. Comb blend. Secure plastic cap or damp towel on hair. Apply heat for 12 minutes. Rinse. Style. Use 3. Strengthen shampoo. Blend quarter size amount up to 5 pumps Super Supplement with 12 Benefits Love at First Lather or your shampoo of choice. Lather. Rinse. Follow with conditioner.